Cristina's Journey won the 2014 Pocahontas. Credit: Reed Palmer Photography. Ron Winchell’s Just Wicked, impressive winner of the $200,000 Adirondack (Grade II) at Saratoga four weeks ago, headlines a field of eight 2-year-old fillies entered for Saturday’s 47th running of the $200,000 Pocahontas (GII) at Churchill Downs. The 1 1/16-mile race is the richest of four stakes events on an 11-race opening weekend card at the famed Louisville racetrack and will officially launch the 2015-16 Road to the Kentucky Oaks. Just Wicked, trained by Steve Asmussen, landed post position No. 7 under regular New York-based rider Jose Ortiz and was installed as the even-money favorite by Churchill Downs odds maker Mike Battaglia. 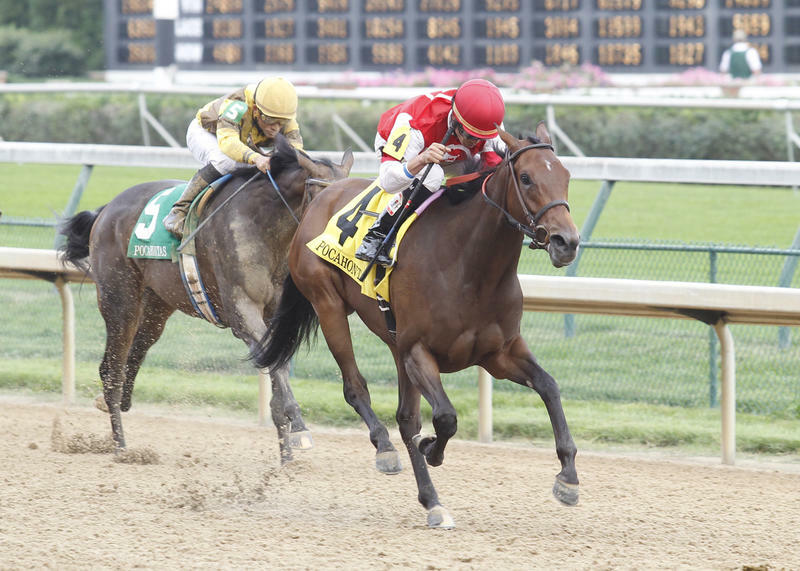 The Pocahontas – the nation’s first two-turn graded stakes race for juvenile fillies – is the first of 31 races that will determine which horses qualify to the 142nd running of the $1 million Longines Kentucky Oaks (GI) on Friday, May 6, 2015. Points awarded to the Top 4 Pocahontas finishers will be 10-4-2-1 as part of the 16-race “Prep Season” that showcases foundation-building races in advance of the “Kentucky Oaks Championship Series,” which begins in late February. Additionally, the Pocahontas is part of the Breeders’ Cup “Win and You’re In” Juvenile Fillies Challenge Division, which means the winner will receive an automatic berth in the starting gate for the $2 million Juvenile Fillies (GI) at Keeneland Race Course on Oct. 31 with entry fees and a travel allowance paid by Breeders’ Cup. Saturday’s Pocahontas field from the rail out (with jockeys and morning line odds): Decked Out (Colby Hernandez, 6-1), Bold Quality (Paco Lopez, 8-1), Dream Dance (Brian Hernandez Jr., 8-1), Princess Kennedy (Gallyn Mitchell, 12-1), Dothraki Queen (Corey Lanerie, 9-2), Vivid Storm (Calvin Borel, 15-1), Just Wicked (Jose Ortiz, 1-1) and Put Da Blame On Me (Albin Jimenez, 10-1). All but Princess Kennedy are Breeders’ Cup-nominated. Just Wicked, a Winchell homebred by Tapit out of 2011 Tiffany Lass winner Wicked Deed, is clearly the horse to beat after inching clear of 6-5 favorite Tonasah inside the final eighth-mile of the Aug. 15 Adirondack at Saratoga to win by 1 ¼ lengths in 1:16.61. It was the gray filly’s second win in a row and the $120,000 paycheck improved her earnings to $184,800 from three starts. Just Wicked could have remained in upstate New York for last Saturday’s $350,000 Spinaway (GI), but Asmussen, a two-time Pocahontas winner with Punch Appeal (2004) and future Kentucky Oaks winner Untapable (2013), was eager to compete in races with more distance. The lone Pocahontas entrant with two-turn experience is Magdalena Racing’s Dothraki Queen, a daughter of Pure Prize who won her debut over a mile on grass at Ellis Park in July. Corey Lanerie, the winner of eight of the last nine Churchill Downs’ riding titles, takes the reins from an absent Robby Albarado. Other entries include Big Chief Thoroughbreds and Gene Voss’ Decked Out, the Keith Desormeaux trainee who was runner-up in the $225,000 Astoria at Belmont Park, third in the $150,000 Schuylerville (GIII) at Saratoga and fourth, 9 ½ lengths behind Just Wicked, in the Adirondack. David Thorner’s Emerald Downs invader Princess Kennedy also has stakes experience with an 8 ¾-length romp in the $49,500 Barbara Shinpoch on Aug. 15. Previously conditioned by Tom Wenzel, she’ll be saddled on Saturday by new trainer Gary “Red Dog” Hartlage, who won the 2011 Pocahontas with future multiple Grade I winner On Fire Baby. While the filly has left her Seattle-base, Princess Kennedy will retain her Pacific Northwest jockey Gallyn Mitchell, the pilot in all four of her career starts. The remaining entrants – Bold Quality (Parx), Dream Dance (Ellis Park), Put Da Blame On Me (Indiana Downs) and Vivid Storm (Ellis Park) – are maiden winners. The Pocahontas, won last year by Christina’s Journey with eventual champion Take Charge Brandi finishing fifth as the favorite, is one of four stakes races on the first Saturday of Churchill Downs’ 11-date September Meet which opens Friday. First post for Saturday’s 11-race card is 12:45 p.m. (all times Eastern). The Pocahontas goes as Race 8 at approximately 4:18 p.m. Other stakes races on the card are the $100,000 Open Mind for female sprinters (Race 5 at 2:45 p.m.); the $150,000 Iroquois (GIII), which kick-starts the 35-race “Road to the Kentucky Derby” (Race 9 at 4:49 p.m.); and the $100,000 Locust Grove (Listed) for fillies and mares at 1 1/16 miles (Race 10 at 5:20 p.m.). A total of 108 horses and one also-eligible were entered Wednesday for Saturday’s card. Entries for the first two days at the September Meet have been brisk compared to last year. The 94 entered horses (and seven also-eligible entries) for Friday’s opener were up 22% compared to 77 a year ago. Entries for Day 2 were up another 16.1% compared to the 93 on the comparative day in 2014.